This is the story of one American’s journey from rural Iowa to West Point to Hollywood and back again in search of the American dream—a dream all Americans once held in common and expected to achieve in their lifetimes. But something happened along the way. For far too many Americans, this dream has slipped through their fingers due to no fault of their own. Hard work, dedication and faith have not been enough. But what can the average American do to rectify the situation when the foe is so strong—the combined might of the military-industrial-media-banking complex? This modern-day leviathan has been steadily eating away at the very fabric of our nation and turning the American dream, and the vision of our founding fathers, into a sordid nightmare from which we are having trouble awakening. Contained in this book are the answers. Eagles Are Gathering is an urgent clarion call to action. The author implores us to stop fighting amongst ourselves and gather in unison to stop the forces of greed and mayhem that have engulfed us in perpetual debt and perpetual war—and ever-diminishing freedom. We the People must heed the dire warnings and the inspirational message of hope contained within this book and act upon them. Merlin Miller’s journey is our journey, and it will lead us on a road to spiritual, economic and national salvation. We must not succumb to the dark powers of a tyrannical New World Order, but rise in unity to defend our sovereignty, unalienable rights, and spiritual and familial well-being. Although the odds are against us and the stakes unbelievably high, we must rise as Eagles to restore the American republic and her traditional goodness. Read this book. Think about it. Pass it on to others. Buy additional copies for friends and family. This is a book that can make a difference. Merlin L. Miller was born and raised in Des Moines, Iowa, and graduated from the United States Military Academy at West Point, NY. He served several years in the U.S. Army where he commanded two units and then worked as an industrial engineering manager for Michelin Tire Company. In 1983, he was accepted into the University of Southern California’s “Peter Stark Motion Picture Producing Program,” graduating in 1985 with an MFA degree in cinema and television. He subsequently became an independent screenwriter, motion picture producer, director, and instructor. His vision is to build a viable and far-reaching alternative to Hollywood, one that can help shape a more positive destiny for the marginalized, yet traditionally valued American majority. In recent years, Merlin wrote a historical treatise, “The American Dream,” and published several articles, connecting military, political and media intrigues. 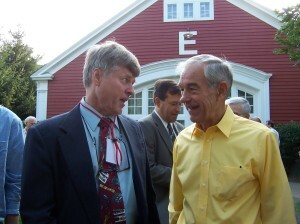 Above, Merlin Miller with former Rep. Ron Paul (R-Texas) during a campaign stop in 2008. In 2007-2008, Merlin became politically active in support of former Rep. Ron Paul’s presidential campaign. In 2012, he was recruited by a small independent political party to be their presidential candidate. During the course of campaigning, Merlin appeared in numerous radio, television and print interviews, wrote “Our Vision for America.” That year, he made his first trip to Iran on a mission of peace, meeting with President Mahmoud Ahmadinejad. 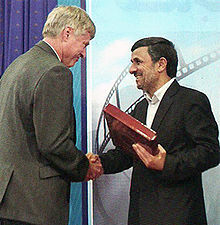 Above, Merlin Miller meets with former Iranian President Mahmoud Ahmadinejad. Merlin plans to produce “False Flag”, a critically important motion picture, and help build a coalition of nationalist, populist, and patriot organizations. United, this coalition could end pervasive political corruption, and help restore America’s traditional goodness—as a freedom-based, constitutional republic. This political effort has led to formation in 2015 of the American Eagle Party—“the UnParty” for we-the-people! In 2015 Merlin and his wife visited Russia, and in November was awarded the “Global Peace Award” by the Foundation to Defend the First Amendment. His controversial and comprehensive “Eagles Are Gathering” (2016) has been published by American Free Press. Merlin has been married for 41 years to Susan, and they have 4 grown daughters, three of whom also graduated from West Point and are serving the nation.